Note: This article is spoiler-full, both for the sake of discussion and as a warning to those who might be affected by the game's more "unexpected" elements. If you want to approach it unspoiled, please do not read on. I'm not going to lie. I have written and rewritten this article approximately five times at this point. Not because I dislike what I wrote before, but because the deeper I delve into Doki Doki Literature Club, the more I find fascinating about it. And as someone who plays visual novels for fun, works on visual novels for a living, and writes for a living, there are multiple angles to it that grab my attention. It took three playthroughs, some game guides, and watching someone else's let's play before I really landed on what hits me most about this game. I mean, yes, it's going to attract a cult following because it mixes Cute and Gory. That's like the mug cake of indie game popularity. But taking apart the structure and delving into just how much you can tamper with the game reveals a surprise level of brilliance that was lost on me at first, even though it's something I have lots of opinions about in other games. That is: this a game whose entire message hinges on choice, the illusion thereof, and the breaking of programming -- on multiple levels. Despite how heavily the story and operation of the game rests on its coding and structure, you don't actually ever need to have had your fingers in Ren'Py code to comprehend what's going on... or how to tinker with it. For those who've yet to experience it and want to be spoiled: you kick off playing what appears to be a three-route dating sim with a very simple function to "choose" your girl. Each time you go to a literature club meeting, you're given a list of words with which your character will write a poem. Figure out which words resonate most with which girls, and you will impress that girl at the next meeting, unlocking part of her path. Also present is club president Monika, not a dating option, but a character who does seem to like you regardless. This is all well and good -- until Sayori (your childhood friend and one of the romanceable heroines) has a breakdown and admits to you that she suffers from major depressive episodes. And recently she's discovered she has feelings for you, and hiding them has made these episodes worse. You can choose either to reciprocate her love or tell her that she is your "dearest friend," but neither option really matters: you will find her in her room, having hanged herself. From there, the game begins to fall apart -- Sayori's character file is deleted, and trying to go back to a previous save point forces a new game to start, with Sayori notably absent and Yuri and Natsuki's personalities going off the rails. If you attempt to romance Natsuki, Yuri will force herself on you, revealing her habits of self-harm and her stalkerish tendencies. After watching her stab herself in front of you, Monika comes in and wipes the game clean -- just you, her, and an empty room. As it happens, that's all she's ever wanted. At some point, she gained self-awareness and fell in love with you -- the player. But the game gave you no options to romance her, so she flipped the script. From talking Sayori into suicide to actively tinkering with the code, she created a landscape where you had no choice but to do as she says. 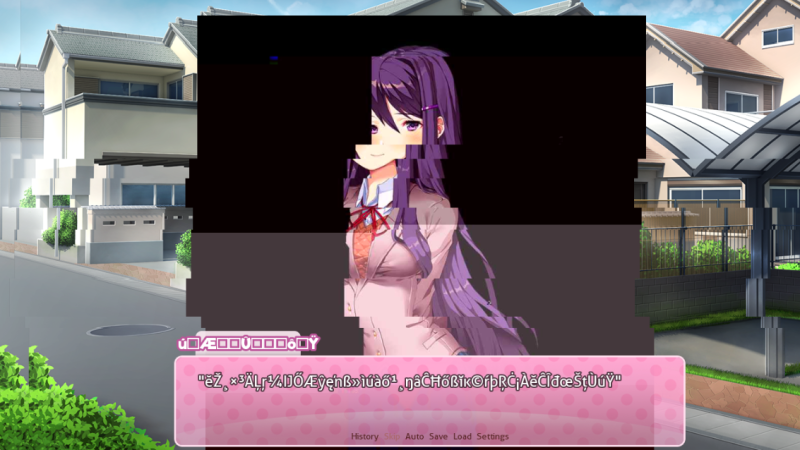 The game ends when you yourself dig into the directory, deleting her character file, which brings the game back to the beginning with all characters but Monika restored. Sayori briefly gains self-awareness, and things look to be going bad again -- but what little of Monika remains destroys the game from within. This is a very long way of saying that your three-route game actually has only one, with a few different scene options along the way. And just as Monika's later tampering gives you only the illusion of choice (a "Yes" button without a "No," or fifteen buttons that say "Monika"), Team Salvato's code railroads you into one ending. 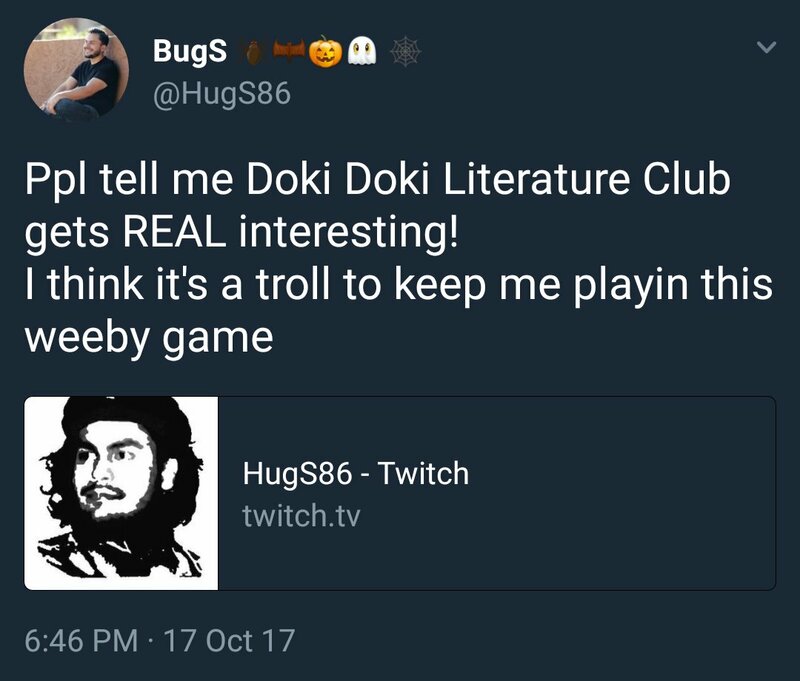 Creator Dan Salvato has gone on record as saying that Doki Doki Literature Club was inspired by his love-hate relationship with the tropes of anime. Pay attention to the characters' reactions to you, and you'll probably see another, slightly more subtle call-out: the mentality of dating sims in general. 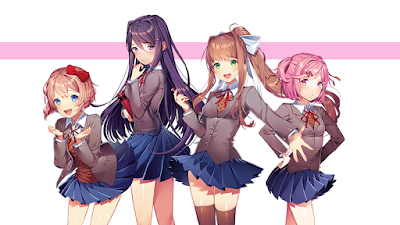 As you're creating poems to impress your girl of choice in the club, only two of the four girls will be at all interested in your work: Monika and the girl you're out to impress. But rather than just being disinterested, the other two girls will call you out on spending all your time trying to get your girl of choice to like you instead of actually working on your writing. Which is, of course, exactly what's going on. Because that's how you dating sim: find out what your fave likes, then keep doing it until they like you. But pay close enough attention -- again -- and the game will show you that your methods aren't actually particularly helpful. In the poem-writing section of the game, it seems easy: Sayori likes bittersweet poems, Natsuki likes cute things, and Yuri likes deep and complex things. 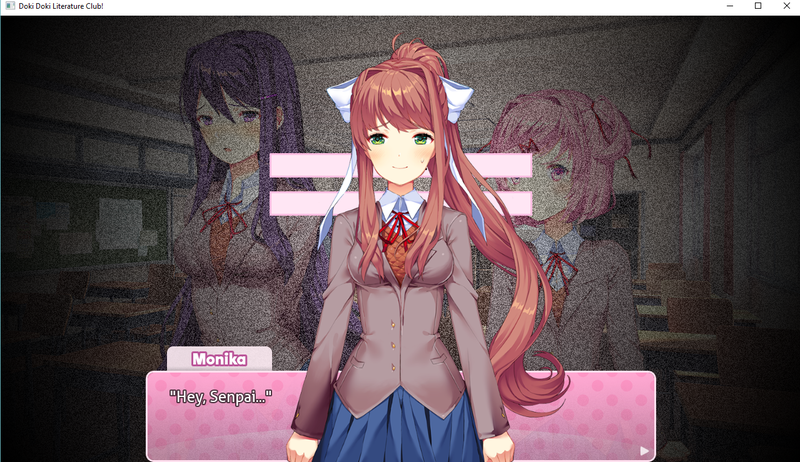 But regardless of Monika's assertion that her classmates are "one-dimensional," observation shows that it's not quite as easy as the game presents it. Each of the three romanceable girls does want something -- and it's the club. Yuri, as we find out rather bluntly in the second arc, expresses herself via self-harm. Natsuki gives implications that her father abuses her. And Sayori bottles up her depression to keep others happy. Each of these girls needs you, yes -- as a fellow club member. Yuri needs the creative outlet, Natsuki needs the safe haven, and Sayori needs to see that the person she loves has a support network bigger than herself. 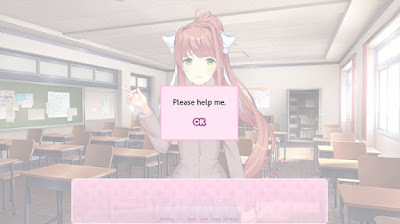 Despite being programmed to confess to you, they all need the literature club more than anything. Of course, this doesn't become evident until everything's already been shot to hell. And it never becomes evident to Monika, whose final words imply that there can never be happiness in the literature club. But that's not necessarily true -- and to accomplish that happiness, you have to take a play out of Monika's book. You have to cheat. Not counting the fake-out endings you get in the course of a run-through (Sayori's suicide, Natsuki's jump-scare), there are three endings you can achieve. But two of them require you to not play entirely fair. Don't feel bad, though. Monika hasn't exactly been playing fair. The first one is the simplest, and one that might already have occurred to you: delete Monika's character file before all this starts. But that's... not the best solution. After all, without Monika, Sayori becomes self-aware. And then the game is over in a matter of moments. 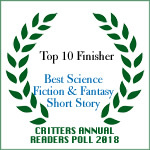 The best possible outcome takes a lot more conscientious work... and a whole lot of savescumming. Normally this wouldn't do any good, but this game is programmed for you to toy with the programming. Basically, you'll have to save before you write the first poem, and carefully play through the first arc three times, unlocking each girl's special scenes. Be sure the first two times not to respond to Sayori's confession -- jump back to the save point and pick a new girl each time, leaving it 'til the third, then tell her you love her. The terrors of the second and third arc will still unfold... but instead of the game collapsing in on itself, there's a brighter ending. And it makes sense, after all. Because when you give each club member equal time, they all get what they want. 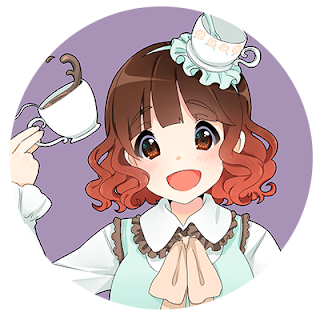 Natsuki feels loved and wanted, and has a friend to share her interests with. Yuri has a safer creative outlet. And Sayori gets to see you and her beloved club united as friends -- which is what this whole mess was about in the first place. 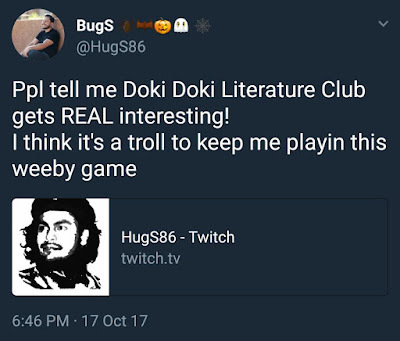 So in its way, Doki Doki Literature Club is absolutely a story that plays on the illusion of choice... but someone determined, who treats the characters the way they'd treat real people (an honor Monika attempted to reserve for herself), discovers that yes, there can be happiness in the literature club. WHAT DO YOU MEAN THAT'S STILL NOT ALL. That's sort of all I wanted to say, but I'd be remiss if I didn't hint at the fact that doing a deep-dive into the Ren'Py code will show you what appear to be the beginnings of an ARG. Searching around online will give you the answers if you're not a Master Hacker, but if that's a hobby of yours, I recommend first you go to the .chr files. They don't actually contain character information (the game functions by noting which files are present or absent from the folder), but they do contain something. Play around a bit, and you'll find references to what appears to be Team Salvato's next project. I'll leave the rest to you to discover. For now, consider giving it a try if somehow you've read all this without actually having played the game. Honestly, no description I give could do the psychological madness justice. It's free -- so if you like it, consider buying the fan pack ($9.99) for a soundtrack, artbook, and wallpapers.